Several months ago I presented the “Activate, Interact, Expand, Empower” framework for effective outreach using #DrownYourTown as a model initiative. This method works by defining the minimum amount of “activation energy” that your target audience is willing to expend to connect with a piece of content. For something like #DrownYourTown, the target audience was “people on twitter who don’t generally think about climate change, at all” and the activation energy was necessarily very low. For the exploding whale, I was more interested in exploiting an existing phenomena–people are generally fascinated by morbid curiosities–so the activation energy could be higher, the project could live on its own website and expect people to find it and spread the word. And they did, to the tune of about 3 million page views over the course of a week. Getting a ton of page views only matters if you do something with that audience. Making viral content is easy, making viral content about something you care about is incredibly difficult. Once you draw an audience in, you need to keep them around long enough to disseminate the information you want to disseminate or mobilize the behaviors you’re trying to mobilize. And that relies on interaction with your new audience. For a twitter-centered campaign, like #DrownYourTown, interacting is easy, the medium was already conversational. For exploding whales, interaction becomes a bit more difficult, I can’t have one-on-one conversations with 1 million unique visitors. By creating a single-serving site that almost demands visitors return and updating the images and news feed enough that returning visitors were rewarded for their efforts, I transitioned an activated audience into an engaged one, more willing to expend effort to dig deeper into the content. Once you have an audience, expansion is the easiest step. Leveraging the public’s fascination with exploding whales to expand on the existing interest, with links to past whale explosions, content-rich news sources, and an article about the deep, internet-driven history of exploding whales. I’ve done a similar thing with #DrownYourTown and even pulled it off with Deep Sea Fauna… with Googly Eyes by linking images directly to the primary scientific literature. An activated, engaged audience is primed to dive deeper into your content. Finally, we empower. By taking that inertia and channeling it into active participation–making your own #DrownYourTown image, signing a petition, learning what to do when you find a stranded marine mammal–you push your audience into the highest level of activation: those willing to turn online content into offline action. When I give science outreach talks, I like to use the wedge of outreach to discuss tailoring your content to the appropriate audience. 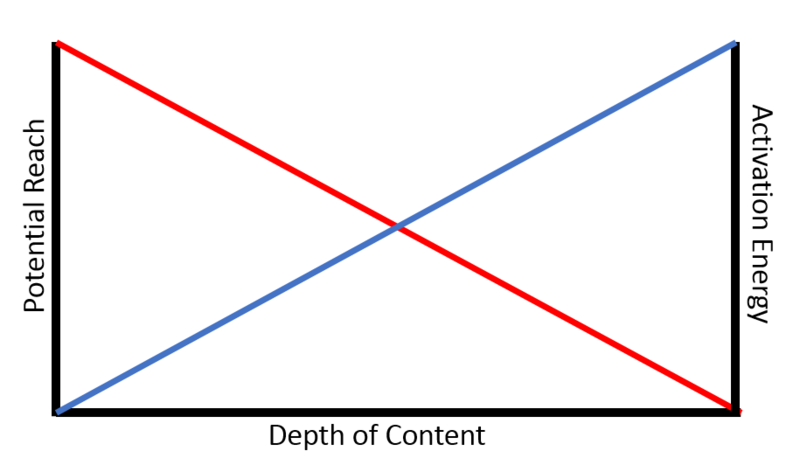 The X-axis is depth of content–how much information you can push to a particular audience. The greater your depth of content, the smaller you potential reach and the more activation energy is required to get you audience to engage with your content. The wedge is a dynamic system; you can build activation energy through progressively more detailed content. The challenge for science outreach is to maintain a continuous stream of lower activation content that attracts new, previously unengaged audiences and pushes them further to the right. Save the National Ocean Sciences Bowl!